This casual wear Jeans by Blue Buddha is produced from optimum quality cotton fabric using cutting edge technology. It is slim fit and Non-Stretchable and is available in 34 size. This Jeans is strong, durable and very comfortable to wear. 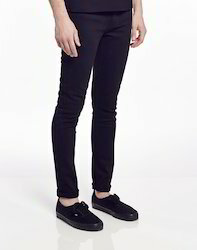 This casual wear Jeans by Blue Buddha is produced from optimum quality cotton fabric using cutting edge technology. These Dark Blue Colored Slim Fitting Denims Are Made From Cotton Lycra.